If you’re a homeowner, you more than likely have some trees in your yard. While these trees certainly add something to the aesthetic of your property, they can also be a nuisance; specifically when they begin to grow all over the place. In order to maintain your trees, you need a chainsaw. 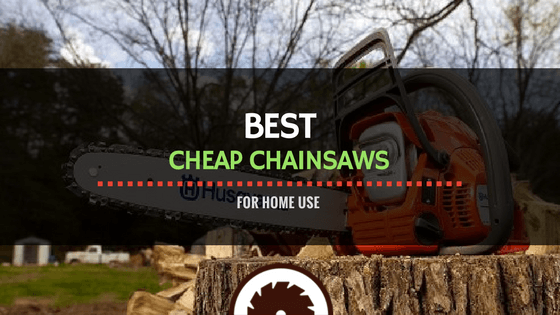 In this roundup review, we'll cover the best cheap chainsaws of 2018 for home use on the market. By "cheap," we certainly don't mean bad-quality, but rather "budget-friendly". You probably don’t want to spend inordinate amounts of money on a chainsaw that you’ll only use once in awhile. You might just need to find a find a budget chainsaw that offers excellent functionality at an affordable price. Read on to learn about the best budget-price chainsaws out there. What Type of Chainsaw is Best for You? In general, Makita makes three different types of chainsaws. These types of chainsaws include gas, corded electric, and battery-powered. Each different type of saw offers its very own benefits and drawbacks. Want to know which type of chainsaw is best for your purposes? Read on! ​When choosing a chainsaw for home use, it’s important to remember that not all chainsaws are created equally. While they all serve the same basic function, they don’t all possess the same quality. There are a number of things to consider when making a purchase on a chainsaw. They include its construction, ease of use, power, cutting ability, and noise level. While lower-end chainsaws will not be as well-constructed as higher-end chainsaws, they should still possess reasonable construction quality. The vast majority of chainsaws, both cheap and expensive, are made out of steel and heavy-duty plastic. You want to make sure that your purchase isn’t going to die out within a year or so. Some chainsaws can be operated with just the push of a button or pull or a trigger while others must be revved up and readied over extended periods of time. Typically, electric and battery-powered chainsaws are much easier to use than gas ones. Gas chainsaws are typically started via pullstring. Corded electric and battery-powered chainsaws are typically started with the push of a button. Even for low prices, you should be able to find chainsaws that pack plenty of power. If you’re seeking a gas chainsaw, try to find one with at least 30cc of power. This should be enough power to handle most around-the-house cutting tasks. If you’re looking for a corded electric, seek out something with at least a 5-amp motor. More interested in a battery-powered chainsaw? Something with at least 18 volts of power should suffice. Of course, if possible, you should go with something that packs more power. But if you’re truly working on a budget, these power numbers will accommodate you. A powerful motor doesn’t ensure that a chainsaw will possess adequate cutting ability. While power is certainly a large component of cutting ability, there are other components which exist. These include the tension-adjusting ability of the chain, the ability of the chainsaw to still lubricated, and kick-back control. Some chainsaws are just designed in a manner which allows for more clean and precise cutting. Make sure to take all components into account. There isn’t a single chainsaw existing on this planet which is quiet. The nature of their operation ensures that they will make at least some noise. However, there are some chainsaws which are quieter than others. In general, gas chainsaws are the loudest. Corded electric and battery-powered chainsaws can be anything from inordinately loud to downright bearable. If you’re going to be using your chainsaw in a residential area, you might want to find one that is on the quieter side. If you’re looking for a cheap gas chainsaw, you might very well be interested in the Husqvarna 240 2 HP Chainsaw. The best gas chainsaw under 200 dollars, it offers superb power, construction quality, and portability. Sporting a 38cc engine, this chainsaw packs plenty of power for use around the house. It can handle everything from small branches to medium-sized trunks and logs. Revved up with a pull string, it’s fairly easy to turn on, typically on requiring one or two pulls each time. It’s equipped with a built-in tension adjuster, allowing you to adjust the tightness of its chain without the use of any tools. Possessing a top-to-side handle on its front as well as an additional handle on its back, it’s very easy to maneuver and control, regardless of your size. In all it weighs in at 10.3 pounds; a very light weight for a gas chainsaw. Not only is this the best cheap gas saw on the market today, it’s also the best cheap saw overall. If you’re looking for an affordable, but high-quality tool which will hold up respectably through the years, this chainsaw from Husqvarna is what you’re looking for. The next chainsaw on our list is the Remington RM4216. Available for under $125, it is the best gas chainsaw for the money on the market today. While it’s not quite on par with the Husqvarna reviewed above, it still offers respectable power, durability, and portability. Available with either a 14-inch or 16-inch saw arm, this chainsaw packs a powerful 42cc motor that can cut through small and medium-sized branches and logs. Revved up with a pull string, it possesses a quick start technology mechanism which can usually get it up-and-running within two pulls. Weighing in at 22 pounds, it’s on the heavy side. This might make it a little difficult for some users to handle, particularly if they’re small or lacking in strength. However, with two ergonomic handles, it’s fairly easy to control and maneuver while in use. Overall, this chainsaw from Remington is the best chainsaw for the money. Despite the fact that it’s available for a relatively small price tag, it still offers quite a bit in the way of value. Our next chainsaw is the WORX WG303.1 Electric Chainsaw. It not only the best electric chainsaw under 100 dollars, but the overall best chainsaw under 100 dollars as well. Offering respectable power and durability, it offers more than enough value for its price. Equipped with a fairly powerful 14.5-amp motor as well as a 16-inch saw arm, this saw can make its way easily through the majority of small and medium sized branches and logs. One of its nice features is its auto-tension adjustment mechanism. This mechanism keeps the chain tightened at all points of use. It weighs in at just 11 pounds; relatively lightweight compared to many other chainsaws on the market. Sporting two different handles, it’s very easy to maneuver during operation. All in all, this is a very solid chainsaw. It offers above-average power and construction quality at a very reasonable price. Its only drawback is that it’s a corded electric chainsaw. This means that it must be used in close proximity to a power outlet. If you’re interested in an affordable battery-powered chainsaw, you might consider this one from BLACK+DECKER. Available for under $100, it packs decent power to go with excellent portability and durability. Weighing in at just 7.2 pounds, it’s ridiculously lightweight and easy to maneuver regardless of your size and strength. It sports two ergonomic handles for ultimate control. Equipped with a 10-inch saw arm, it does a superb job of cutting all small wood pieces, and some medium wood pieces. With 20 volts of power, it’s reasonably and consistently powerful. For the most part, it’s very consistent in its cutting ability. While it’s certainly not an elite battery-powered chainsaw, the LCS1020 still offers quite a bit of value at its price. If you seek respectable power as well as portability and durability on a budget, this would be a great choice for you. The most affordable chainsaw on our list is the Ivation Electric Chainsaw. For its price, it offers quite a bit of value in the ways of power and durability. Coming equipped with a 16-inch saw arm as well as a 15-amp motor, this chainsaw is big and powerful enough to cut through the majority of small and medium sized branches and logs. Possessing a built-in tension adjusting mechanism, it’s easy to maintain and keep running smoothly. Weighing in at around 13 pounds, this saw is fairly standard in terms of weight. It’s not light, but not too heavy either. Possessing two different ergonomic handles, it’s fairly simple to operate and maneuver. All in all, this is a solid chainsaw, especially for its low price. Its one true drawback is its corded design, which will keep you tied down in close proximity to a power outlet at all points of use. But for the price, you can’t ask for much more. When buying a chainsaw solely for at-home use, there is no reason to spend large amounts of money. There are plenty of affordable, high-quality chainsaws on the market today. There’s no reason that you shouldn’t be able to find one. Currently, the best budget chainsaw for home use is the Husqvarna 240 2 HP Chainsaw. Available for under $200, this gas-powered chainsaw offers excellent power, durability, and portability as well as fantastic overall functionality. If you want to keep the trees in your yard looking neat and maintained, a chainsaw is a tool that you need in your arsenal.